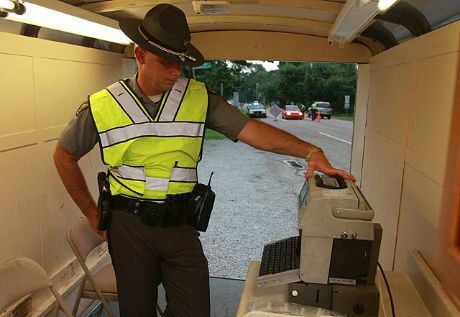 A court decision discrediting the reliability of machines used by hundreds of Ohio law-enforcement agencies to test drunken drivers could be the "death blow" for the controversial devices, defense attorneys say. But a spokeswoman for the Ohio Department of Health, the state agency that oversees the Intoxilyzer 8000, said officials remain confident of its "performance and reliability." The ruling was rendered Aug. 13 by Judge Teresa L. Liston, a retired Franklin County Municipal judge appointed by the Ohio Supreme Court to hear eight consolidated cases in Marietta Municipal Court where motorists were challenging test results obtained using the Intoxilyzer 8000. Liston concluded after a five-day hearing that included testimony by expert witnesses on both sides that the machine has a "presumption of reliability" because it is officially approved by the Department of Health. However, results from the Intoxilyzer 8000 are "not scientifically reliable and the court, as a gatekeeper against unscientific evidence, must prohibit them from being introduced as evidence in this case." "Through evidence, we convinced the court that these machines are unreliable," said Tim Huey, a Columbus lawyer involved in the case and the past president of the Ohio Association of Criminal Defense Lawyers who has been fighting the breath-testing machines for years. "Is it going to usher it out the door tomorrow? No." But Huey said Liston’s decision could be the "death blow" for the machine that has faced repeated legal challenges since first introduced in Ohio in 2009. The Health Department, which certifies the Intoxilyzer 8000, bought 700 of the portable testers using a $5 million federal grant. About 400 are in use around Ohio now, although not in Franklin County, Huey said. Huey and other defense attorneys have filed more than 50 cases challenging the machines on behalf of clients charged with driving under the influence. Attorneys argue that heat, humidity and other factors often skew the results. Prosecutors have relied in the past on a 1984 Ohio Supreme Court decision that said because the machines were officially certified by the state, they could not be challenged by expert witnesses. However, several judges, including Judge Gary Dumm of Circleville Municipal Court in a 2011 decision, challenged that, saying Intoxilyzer 8000 results will not be admitted in their courts. Tessie Pollock of the Department of Health said agency officials know about the Marietta ruling. "But please be aware that 98 percent of the appellate rulings are in favor of the state and deem the I-8000 a reliable instrument. There are approximately 400 instruments currently deployed throughout the state. The Intoxilyzer 8000 was chosen for use in Ohio because of its proven performance, reliability and repeatability in extensive testing at the state and federal levels." While court challenges are expected, Pollock said, "we are confident that the use of breath alcohol-testing instruments helps to reduce impaired driving and saves lives."